Taste test: Welcome back! 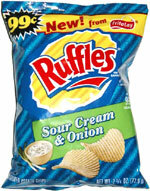 It has been a long time living in the snack world without Ruffles making a sour cream & onion chip. Way back in the 80s, they had the best SC&O chip on the planet. Then, for some reason, they changed the flavor to 'French Onion', and then went to the 'Extreme' version, and then dropped it altogether. 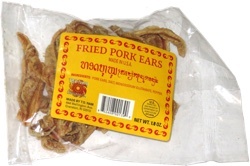 Now, the flavor that we grew up with and loved so much is back on store shelves, with a new bag, etc. The other big change is that these chips are now in the 'new' style of having the wider ridges. The chips are also a bit thicker than before. We liked the old, tight ridges, in fact, it's one reason we still gobble through a bag of Wachusett Sour Cream & Onion in one sitting. But it's hard to argue with the king of sour cream & onion at the moment, Frito-Lay, which with Ruffles and the Lay's version, dominates this flavor at the moment.